The holidays and the unexpected stress fracture in my foot has put me out of action for almost two months. Although the doctor insists that I have stay in that bulky healing boot to stabilize the foot, I am determined to cook and blog a recipe this week. I’ve chosen to try Tyler Florence Blueberry Blintzes on Food Network this week. It has color, texture, and my favorite blueberry sauce. This is just the pick-me-up I needed to get through the rehabilitation of my stress fracture. So proud that I managed to put this together despite having to hobble around in the kitchen. 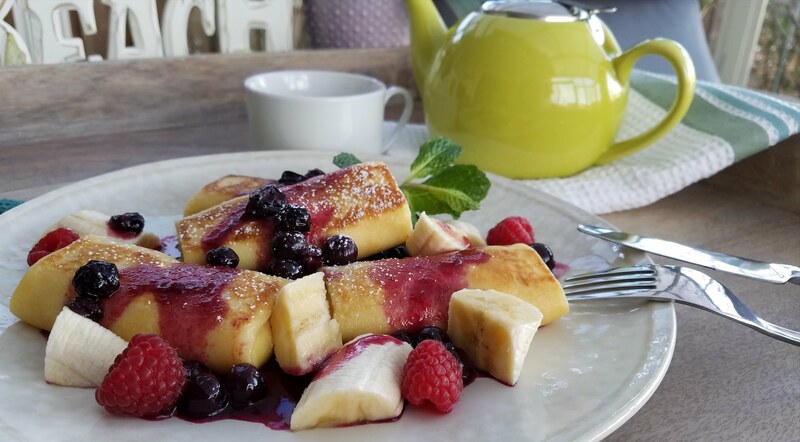 Prepare the blueberry sauce, cheese filling, and crepe batter the night before and assemble them the next day for breakfast. Awesome! Combine the butter, blueberry, sugar, cornstarch, and lemon juice in a small saucepan over medium high heat. 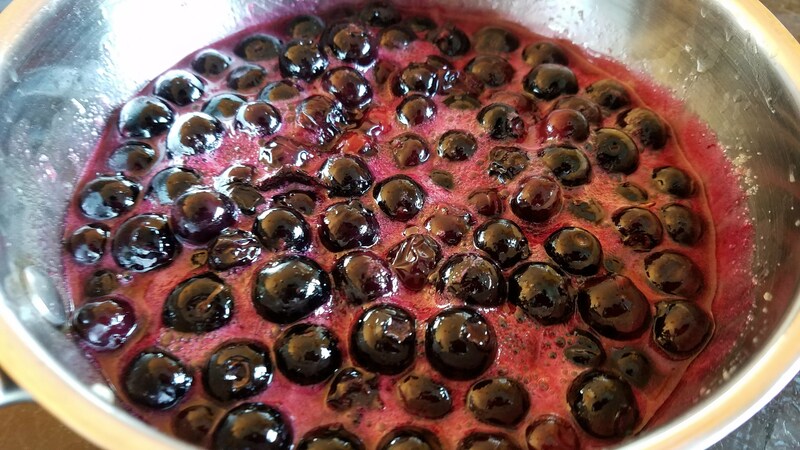 Bring to a slow boil and stir gently until the berries just starts to break down and release their juices. I turned off the heat immediately since I am doing the sauce ahead and will heat it up again the next day. I like to keep the berries whole as much as possible. In a blender, combine the ricotta cheese, cream cheese, confectioners’ sugar, lemon zest, and egg until smooth. Since I am doing ahead. I kept it in the fridge overnight. In a blender, combine the milk water, eggs, flour, salt, and sugar until smooth and lump free. Scrape down the side of the blender and add the 3 Tbsp of melted butter. Blend again until incorporated. Refrigerate the batter overnight. Remove the batter from the fridge the next day. Using a whisk, stir the batter until it is smooth again. Transfer the cheese filling to the freezer to firm it up while you prepare the crepe. Grease an 8-inch skillet with melted butter over medium heat. Pour 1/4 cup of batter into the heated skillet and swirl it around to coat the bottom of the pan evenly. Cook for 45 seconds until the crepe batter sets and the edges are dry and starts to pull away from the pan. Loosen the edges with a spatula and flip the crepe over and cook for another 30 seconds until lightly brown. Do not over cook. 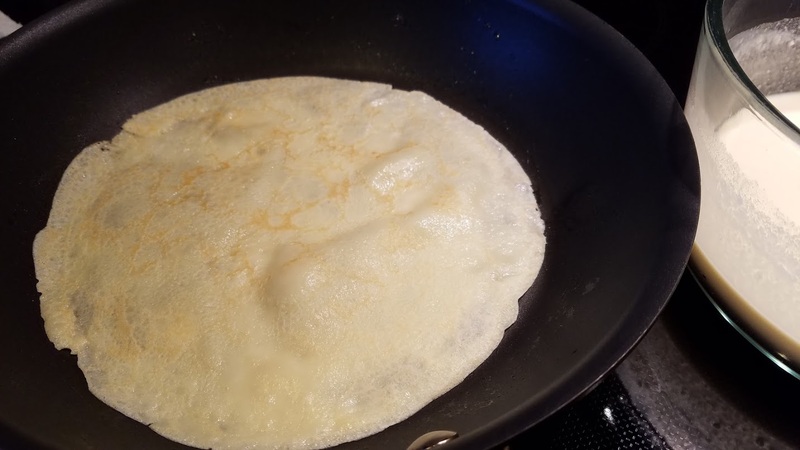 The crepe should be pliable, not dry and crisp. Transfer the crepe to a plate. Repeat with the remaining batter. Stack the crepes and keep them covered with a towel to keep them from drying out. It makes 10 – 12 crepes. 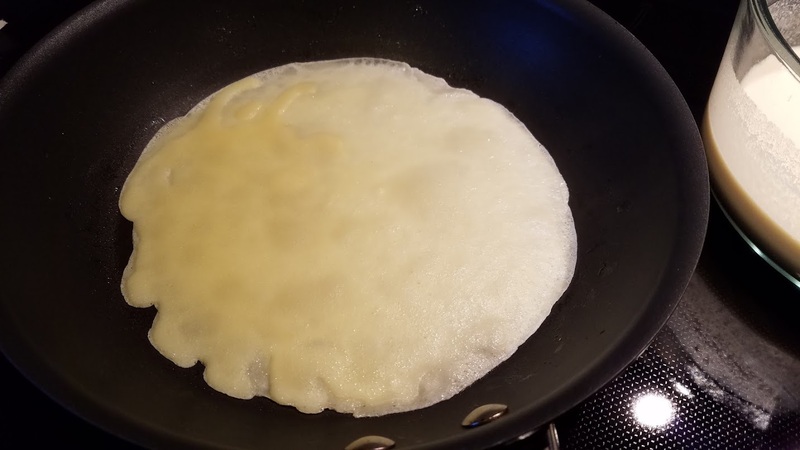 Lay a crepe out on a flat round plate. Spoon just under 1/4 cup of cheese filling along the lower third of the crepe. Fold the bottom over the cheese filling, then fold the two sides towards the center. Roll the crepe up like a spring roll/burrito. Set the blintz aside, seam-side down. 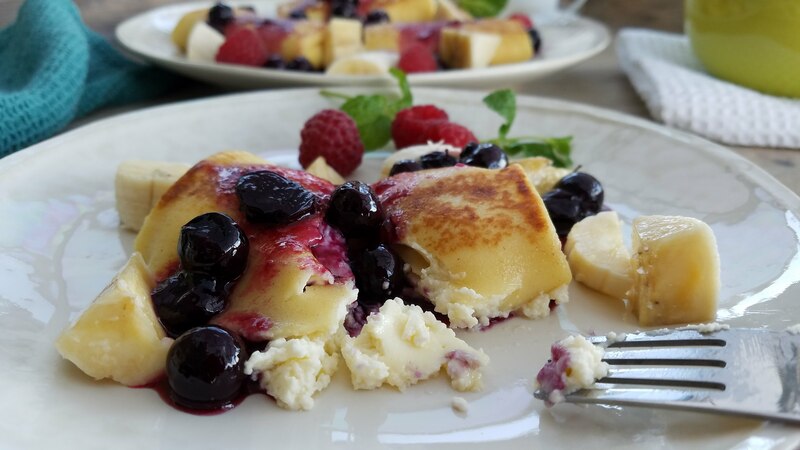 Repeat until all the blintzes are wrapped. Grease the skillet with melted butter again. Pan fry all the blintzes over medium high heat about 2 minutes on each side until crisp and golden. Transfer the blintzes to a sheet pan and bake for 10 minutes so the eggs in the filling cooks slightly and set. 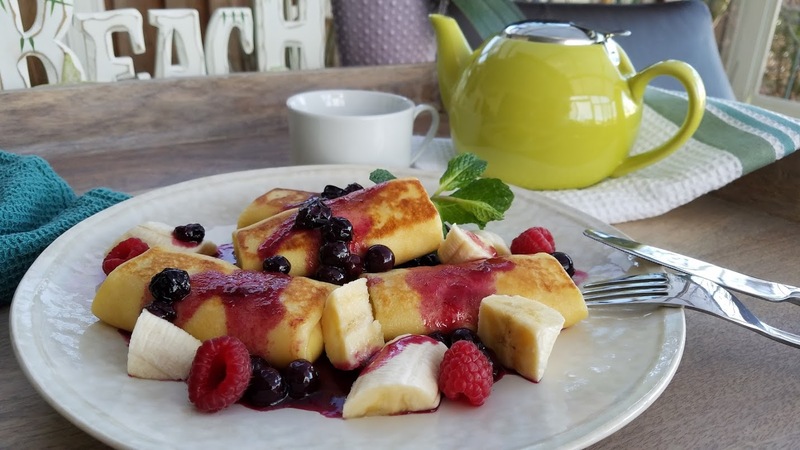 Using a spatula, transfer the blintzes to a serving plate. Spoon the blueberry sauces on top. Garnish with raspberry and banana chunks. Dust with confectioner’s sugar and serve.